I hope you had a lovely weekend and that you are now ready to face the week. My weekend has been so tranquil and care free I've never felt so relaxed in my life; my significant other and I went for a mini get away to quietly celebrate his birthday at a home-stay. This place we stayed still takes all significant descriptive words out of my mouth, its beyond beautiful. We didn't explore much other than bum around and stuff ourselves with seafood and enjoy the fine and little things offered by nature. I actually expected the haze to ruin our plans and we had adjusted ourselves to an indoor mindset but after it rained for like 2 hours and a half, everything was perfect. Damai looked wonderful. The air and the skies cleared up and we could see the skies for the first time in 3 weeks or so. It really brightened up our mood but not enough to take us trekking or sightseeing. It was also a great experience meeting new people from other countries and just chatting over coffee about the usual stuff i.e. politics and weather and the Brooks. The host of the place is quite friendly and warm, I didn't feel like a guest at all....it just felt like I've always been living there. I was supposed to snap photos for a week's content but I couldn't bring myself to cooperate with the initial schedule. I was into the whole chill vibe, relaxing and being aware of my surroundings. Funny enough I hadn't realise that my camera's battery wasn't charged so halfway into the snapping it seized co-operating but luckily we had managed to take these few photos. Would you believe that this Forever 21 jumpsuit is thrifted, at first I had mixed feelings about it but now I want to wear it all the time. I got it while thrifting with my sister back in Tanzania for like 3USD, its crazy cheap!! I just love how comfortable this onesie is, it has like a small tie at the front which when done it outlines the curves instead of giving you that 'swallowed' into the clothing look. This jumpsuit is pretty modest, you can even wear it work, just add pumps and a slightly bright blazer a wide belt and you're great to go. 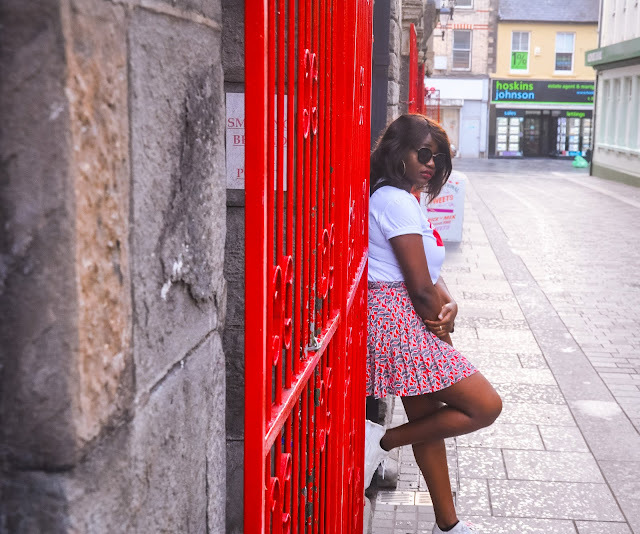 For a more casual look you can opt to pair it with bright sandals or flats and you're pretty much done, see how I paired it here and for the full post see here. This is me trying out new things and looking funny while at it, my hair situation definitely let me down today. I am so looking forward to going back to this place but until I've had enough of it I am not sure I am ready to disclose the name and location. Sometimes you got to keep the good things for yourself || insert evil silly laughter|| and this place is my good thing at the moment. I hope you can let me getaway with this. Wishing you all a lovely and productive week.